SpellQuizzer is an educational program developed for Windows that help children learn their spelling and vocabulary words. 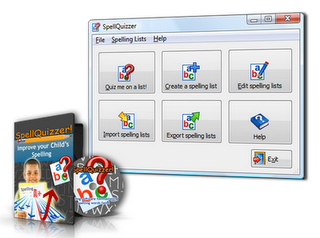 With SpellQuizzer, you enter the child’s spelling words into the software making a sound recording of each word. SpellQuizzer then quizzes your child on his or her words. The program was so user friendly that in a few short minutes I was able to explain to Andrew, my 7 year old, how to create his own spelling list himself. He loved being quizzed by his own voice. In addition to being extremely easy to setup, my favorite feature of this software is that it is not designed with any one spelling curriculum in mind. I will use this program with my 2nd grader, 6th grader, and 8th grader. From kindergarten to high school, this program will compliment virtually any spelling curriculum. In fact, a program like this would have been quite valuable to me two decades ago when I was in college taking medical terminology classes. The software has a built-in spell checker that warns the user when entering a word that appears to be spelled incorrectly. And there is a community area on their web site with discussion forums. Also on the web site is an area where users can easily export and import SpellQuizzer spelling list to share with other SpellQuizzer users. As a home schooling parent, I am very selective in my curriculum choices. Not only does it need to be a good value for my money but also must have practical value. This program is both and is one that I would recommend for those in home education. However, it is not just for those who homeschool. I will recommend this to anyone with children who might struggle with spelling or just want to have fun learning new words. Let me suggest that you go to the website, view the video demonstrations, and download your free trial version of the SpellQuizzer. Dan Hite at Tedco Software has been so kind to offer a free license ($29.00 value) to one of my blessed readers. To register drop me an email, kimberlyw1@wildblue.net with the subject line SpellQuizzer. I will announce the winner on July 1st! And be sure to tell your friends! I will post this for my readers along with a link to the CREW. Glad to meet you, and see you on deck! blessings!! Stopping by from the crew. We love spellquizzer. I’ll tell my friends about this giveaway.